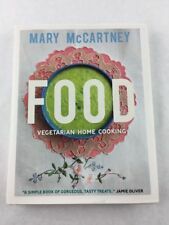 Food by Mary McCartney (English) Hardcover Book Free Shipping! 'This is a jewel of a book - gorgeous recipes that beg to be eaten!'. Sophie Dahl. Mary's photography book, From Where I Stand, a retrospective look at her photographic work to date, was published in 2010. At My Table is Mary's second cookbook. 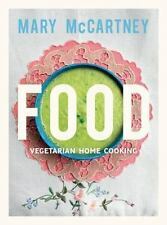 In this book, the author wants to show us that vegetarian cooking can be just as celebratory and special. Title At My Table. Health & Beauty. ISBN-13 9780701189372. Hardcover & Dust Jacket. M easures 10" X 7 3/4". Minor wear to dust jacket. Very Good Condition. Subject Vegetarian & Vegan Cooking. Desserts and baking. First edition. First printing, with full number line 1 to 10. Publisher: New York : Sterling Epicure, 2013. Special Attributes 1st Edition. May contain highlighting, handwriting or underlining through out the book. Book may show some wear. Used books may not contain supplements such as access codes, CDs, etc. Every item ships the same or next business day with tracking number emailed to you. Get Bombed!! Desserts and baking. First edition. First printing, with full number line 1 to 10. Publisher: New York : Sterling Epicure, 2013. Basics and sides --.